January 2019 is set to be the most popular Veganuary yet, with over 14,000 people pledging to stick to a vegan diet and lifestyle for the next month. Digestion: a sudden increase in fibre and indigestible starch from vegan staples like pulses, beans, nuts and seeds can cause bloating and wind. Our gut bacteria are influenced by what we eat, and it can take time for them to adapt to a different way of eating. They thrive on fibre, fermenting it in our gut, which is why one of the side effects of a vegan diet can be uncomfortable wind and bloating! Bowel movements may also change: some people experience constipation whilst others find stools become loose and more frequent. Again, this is down to the change in fibre intake. 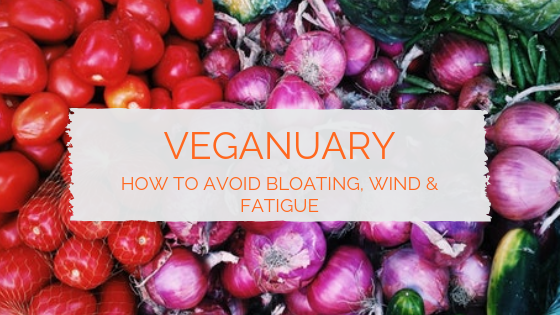 If you’re suffering with wind and bloating try using a plant-based digestive enzyme formula to support the breakdown of tough plant fibres and starches. Look for one containing alpha-galactosidase, an enzyme proven to reduce gas and bloating. Soaking pulses before cooking and using fermented soya products like miso and tempeh can aid digestion. Sprouting beans in a seed sprouter can make them easier to digest. Soak nuts overnight then allow to dry before eating; this can aid digestability. Be mindful of your fluid intake, especially if constipated. Fibre soaks up fluid in the gut, so remember to drink more water throughout the day, and opt for hydrating foods like soups and stews that combine fibre-rich beans and pulses with fluids. Energy levels: switching from being carnivore to vegan means your body has to adapt to different nutrient sources. This can affect energy levels, particularly if you’re a pre-menopausal woman with regular periods as you are now reliant on plant-based or non-haem iron sources. Zinc: red meat, poultry, and seafood are packed with easily absorbed zinc, so your body has to adapt to deriving it from plant foods on a vegan diet. Nuts and seeds – especially pumpkin seeds – are good sources, but they also contain phytic acid which can impair zinc absorption. Soaking the nuts and seeds before eating helps to breakdown phytic acid and improve zinc bioavailability. Vitamin B12: plant forms of B12 are not readily used by us humans. You may have enough B12 stores in your system to manage Veganuary, but if veganism is a long-term plan, consider using a B12 supplement or B-Complex containing B12. Protein: protein is present in varying amounts in foods, which is where the term protein quality comes from. Eggs are an example of high quality or perfect protein as they contain the right ratio of amino acids (the building blocks of protein) to match our human needs. On a vegan diet it is important to combine different protein sources at each meal so that over the course of the day you get all the amino acids you need. Omega-3 fats: the omega-3 oils found in oily fish are DHA (docosahexanoic acid) and EPA (eicosapentaenoic acid). We can use these straight away with no need for conversion: they help regulate inflammation and support heart health and mental wellbeing. Plant foods contain ALA (alpha linolenic acid) which is the ‘parent’ of DHA and EPA. It goes through several conversion pathways in the body to become EPA and DHA and we lose some of it along the way. Because of these conversion losses, it’s important for vegans to include ALA sources everyday. The richest concentrated source of ALA is flaxseed oil; this can be drizzled over cooked vegetables, salads, granola, coconut or soya yoghurt, included in smoothies – the ideas are endless! I know a lady who adds it to her gravy! It can be added to hot foods but don’t cook with it as high temperatures affect the oil structure. Other sources of ALA include walnuts, pumpkin seeds, pumpkin seed oil, hemp oil, and chia seeds. 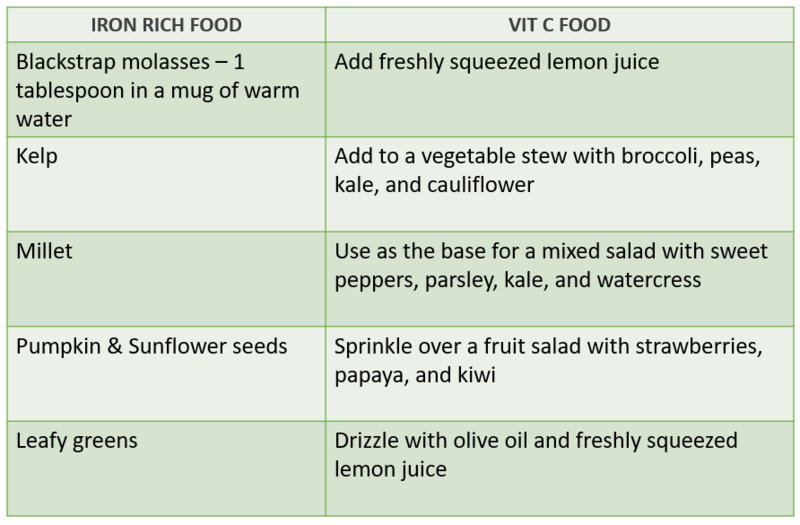 Plant-based diets can be as varied and nutritious as meaty-fishy ones, but they do require thoughtful planning, especially at the outset. Browse these recipe blogs for meal inspiration and remember to join the Facebook group and follow me on Twitter where I share a #MeatfreeMonday recipe each week.